Alport syndrome Females Are Not "Just Carriers"
Home > Alport Syndrome females > Alport syndrome Females Are Not "Just Carriers"
26 May Alport syndrome Females Are Not "Just Carriers"
Many Alport syndrome females have been told they are “just a carrier” but they often find out years later this description is misleading. I was diagnosed with Chronic Nephritis when I was 3 years old after a biopsy. When I was about 13 years old we changed doctors. My new doctor reviewed all of my paperwork and sent it over to the new hospital. At that time I was diagnosed with Alport syndrome. I am the first in my family that we know of with Alport syndrome. I was told most woman were just carriers and I would be fine the rest of my life. I just needed to come in for routine checkups. Boy was I wrong! I was 27 years old when I started to feel something was wrong. I felt tired all time, no energy and lots of anxiety. I went in to see my primary care doctor. She told me it was just stress due to my job. She even ordered an ultrasound of my kidneys knowing that I had Alport syndrome. The results showed I was fine. I woke up one morning a few months later with my vision blurry and went into the ER. They ran several test and came back to tell me that my kidneys were only functioning at 3% and I was starting dialysis. I was in total shock! I had no idea something like this would ever happen to me as I was told I was only a carrier. I continued dialysis for 9 months while my Dad and I went through several test to see if he was a match to donate. He was! It has been 6 years since my transplant and I’ve never been healthier! 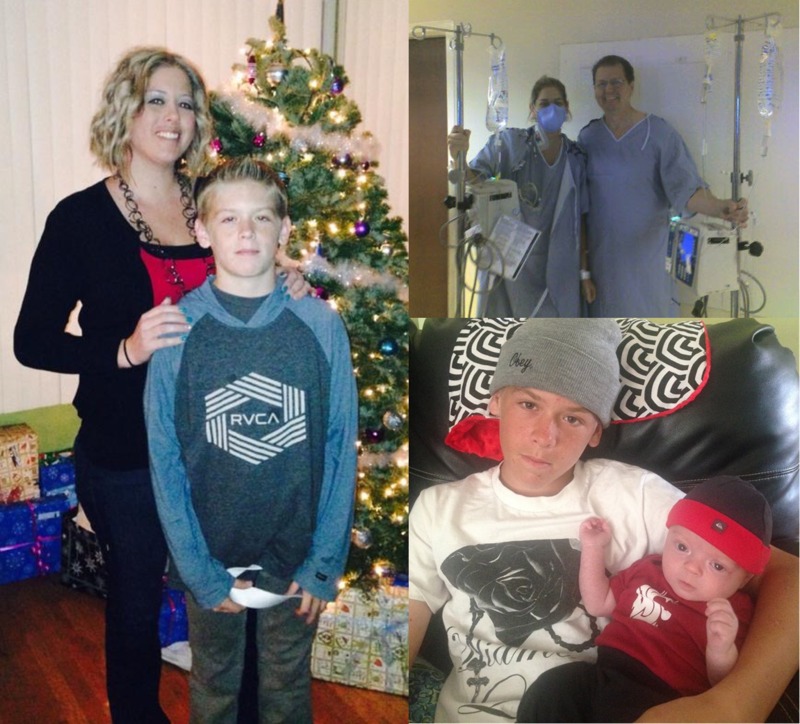 I have a 14 year old son with Alport syndrome who will need a transplant one day and a healthy 4 month old baby boy. I am now living life to the fullest! Unfortunately, Christina’s story is not unique. Many women in Alport syndrome families have been told they are “just a carrier.” In the science of genetics, the term “carrier” has a specific meaning. One source explains that “carriers often do not show any signs of the trait but can pass it on to their offspring.” When applied to females with Alport syndrome, the term “carrier” is used to imply that these women have no risk of developing renal disease or experiencing end-stage renal failure. Like Christina, many women find out years later that this definition does not apply to them. Understanding how the term “carrier” came into use with Alport syndrome makes more sense when you understand the history of research in Alport syndrome. Early studies of Alport syndrome were conducted using large families who happened to have the X-linked mode of inheritance. In those early days, the use of the term “carrier” made perfect sense because the families researchers were studying reflected that term. Many of the females in those studies appeared to carry the gene from one generation to another without suffering the effects of Alport syndrome. Although there were some females in the studies who did suffer kidney failure from Alport syndrome, it was felt those cases were exceptions and would be understood through more research. As those early researchers had hoped, further research has helped us understand so much more today about Alport syndrome and women. Today we know that 95.5% of females with X-linked Alport syndrome actually have microscopic hematuria, the primary symptom of Alport syndrome. These females are not carriers. They are patients! That distinction is critical. Men and women who are diagnosed as Alport syndrome patients are typically seen regularly by their physician and monitored for changes in kidney health. Medication is often prescribed to prolong kidney function and control other symptoms like high blood pressure, and patients are educated on eating a kidney-friendly diet. However, when Alport syndrome females are labeled as “just a carrier,” they and their doctors fail to watch for changes in kidney function or take precautions to protect the kidneys, leading to situations similar to that Christina described above. Make sure the women in your life take care of their kidney health, too, through regular visits with their doctor to monitor their urine and blood pressure! Why Diagnose Alport syndrome Females?